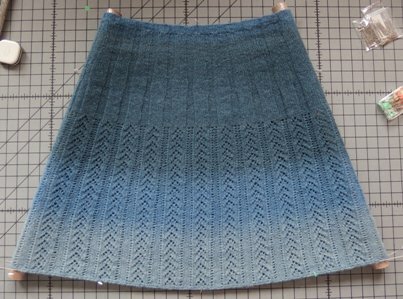 I think skirts are my latest favorite thing to knit. 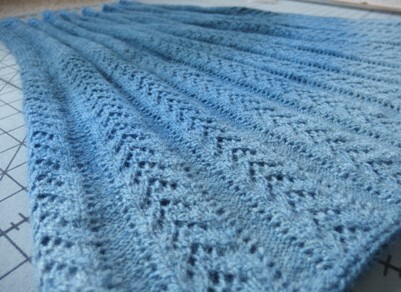 Knit with two balls of yarn in alternating rows to extend (double) the long color repeat of Kauni Effektgarn. Once I got the color repeats lined up. Seriously, that was the hardest part. 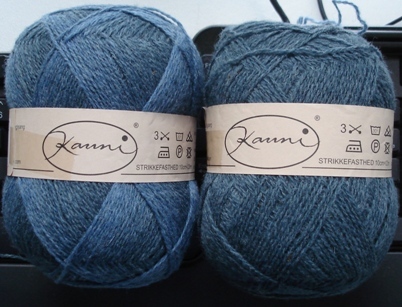 I was lucky, I happened to be at Knit Purl when the yarn had just arrived and I was able to pick two 150g balls from a full (10 balls) bag. 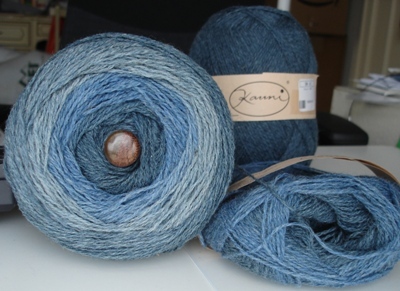 Kauni Effektgarn, is sold by the gram, the balls are somewhere around 150g (+/-30g), it has long color repeats and there are no dyelots. I picked two of the larger balls that were dark at the center so my skirt would be dark at the top transitioning to light at the hem (skirt is knit top down). I ended up rewinding both 150g balls to get all the dark yarn at the beginning and lining up the color repeats. The two balls appeared to be different dylelots, if they had dyelots, one was brighter, the other grayer, but not noticeable when knit up. I used 250g of the 300g I started with. 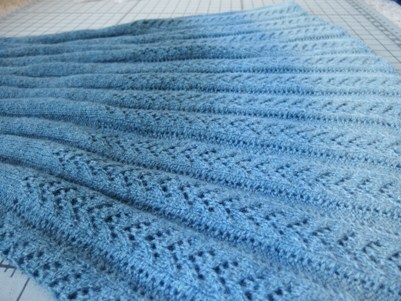 The lace pattern is quick to memorize and gives the skirt a nice drape in a light springy wool. I love this color, kind of a grayish denim blue. instead of knitting a drawstring (DH thought that was pretty funny when I told him that was in the pattern!) I used a grosgrain ribbon. 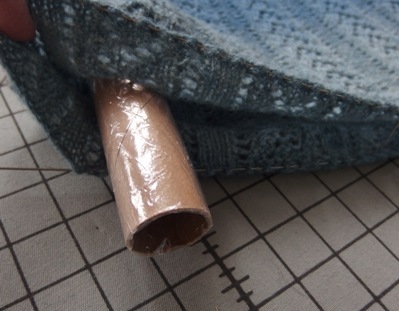 I used the cardboard centers from a couple of rolls of wrapping paper covered with plastic wrap for blocking. Entry filed under: Finished!. 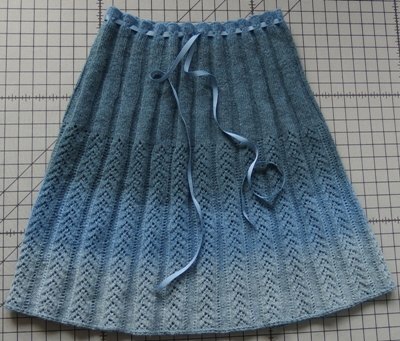 Tags: Kauni Effektgarn, knitted skirt.